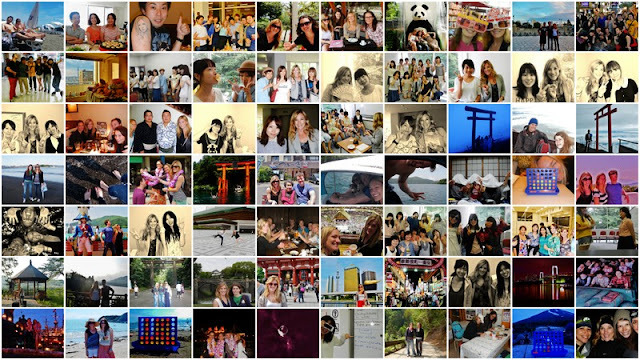 Teaching in Tokyo, Japan for the summer of 2012 was wonderful thanks to my good friends and students! My suitcases are stuffed full of presents from my students and my wallet has 4 different currencies. I'm leaving Japan, and I'm in denial. My time here has been very bitter and sweet and 2 1/2 months really does fly by when you are so busy working and sightseeing on the weekends. This opportunity has been a blessing from god in so many ways. As I begin my journey throughout South East Asia for the next 30 days, I'm taking a look back at what brought me to this point in my life. It all started my junior year of college at Loyola Marymount University when Oscar Borboa, the editor in cheif of our student run newspaper encouraged me to apply for a summer study scholarship program in Korea. I was awarded the 2 week adventure of a lifetime and after a tour of YBM decided that would be my first job upon graduating college back in May of 2010. After a wonderful year in Korea, possibly the best year of my life, I returned to San Diego to start a Masters in TESOL with the goal of becoming a well educated ESL professional. During my summer vacation in 2012, I sought out a university teaching job in Japan with Westgate and after a short 8 months in California I boarded the plane to Tokyo and arrived on May 1st. Starting today I will be taking a 30 day trip around SEA. I'll start out in Bali where I will meet my university professor's gamelan trainers and stay in Ubud. Then I'll meet a good friend from graduate school and hang out with her family in Denpasar. Finally, I'll hang out in Legian and do a trip to Lombangan Island. After Bali, I have the opportunity to see one of my best friends from college in Perth, Australia for one week. Leaving the Austrailian winter behind I'll have to learn to adjust to the heat in Bangkok, Thailand and survive a long bus ride to Cambodia to Siem Riep. To top off my 30 day adventure I'll fly up to Hanoi and travel to Halong Bay and finally stay with another friend in Ho Chi Minh. At the end of my 30 days I'll return to Tokyo for 2 nights and then fly back to California on a Sunday. And then the next adventure begins the next morning at 9 am in my new ESL classroom in San Diego. With so little time for relaxation during the past 2.5 months and so little time to relax upon returning home, I'm going to do my best to take in the atmosphere of each country while sleeping in and reading some great books. For those of you reading that have never traveled abroad, get out there already! Traveling for a short time is one thing, but living is another. You truly get to know the culture of each place you live and it will change your perspective on so many things that you believed in. After coming to Asia and experiencing so many different cultures and countries I have learned that even among Asian countries they are all so different and each culture has its own characteristics. So stay with a host family, get out of the tourist trap area, and don't be afraid to wander off the beaten path. I have absolutely loved my time here in Japan and have made so many wonderful friends! Happy travels to all of my friends from Japan! Such an awesome blog! Thanks for sharing your experiences.